Although some of them can be quite beautiful, the appearance of shelf fungi coming through the bark of a tree is a bad sign indeed. These "mushrooms" are actually the fruiting body of a fungus. When they are present, they mean that a rotting fungus is growing on the inside of the tree. The shelf fungi stick their heads out into the open so that they can cast spores into the air to go and infect other trees. 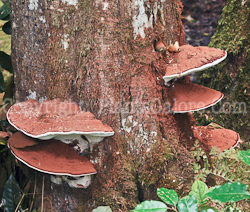 When the shelf fungi are located near ground level, it often means that an extensive amount of root rot is active. This is bad news since it means at least two things. One is that the tree is losing vigor since it is surviving on a root system of decreased size. There are probably stems and branches that have either died or will die due to the lack of roots to provided needed water. The other warning indicated by shelf fungi is that the tree is now less stable than it would be if it were totally healthy. Root rots may either cause the death of roots or, more likely, they are just helping to decompose roots that have already died for some other reason such as soil compaction, nearby construction or just the advanced age of the tree. Either way, one of the roles of roots is to provide an anchor for the plant. When they are gone, the tree is more likely to fall over in an ice storm or on a windy day. What can you do about shelf fungi? The practical answer is...nothing. They are a sign that the tree is in serious trouble and probably has been for a long time. By the time they show up, there is little chance of rejuvenating the root system to change the course of events. Usually, all you can do is try to evaluate what damage the tree might do if it falls over in a storm...actually, I have seen ones that fell over on a nice, calm summer day too. Will it fall onto your house or some other valued part of the property such as a shed or backyard pond. Will it possibly be dangerous to people who might be in the area? Nobody can predict exactly when a tree will come down. 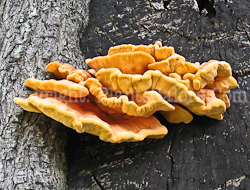 All you can say is that the presence of the shelf fungi increases the probability that it will come down sooner than would a similar, healthy tree. There are people called Certified Arborists in most communities who, for a fee, will come and evaluate your tree. In the end, the best advise is probably to play it conservatively, have the tree cut down and avoid potential disasters. Why take the risk?